Good news ! 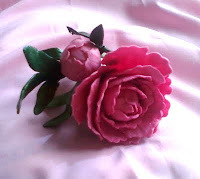 At last I received my parcel, my friend was kind enough to fulfill my wishlist of Thai Clay and flower cutters ! 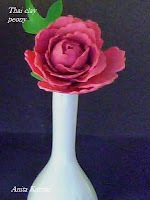 I love peonies and enjoy making them , earlier I had made peonies without cutters and my friends had also liked them. This peony has been made with petals of 3 sizes , the petals are too many to count! Its quite large, at least 3" in diameter. Thai Clay and cutters are pretty expensive here in India and my homemade cold porcelain works just as well ! very nice and elegant work. Karishma, thanks a lot !